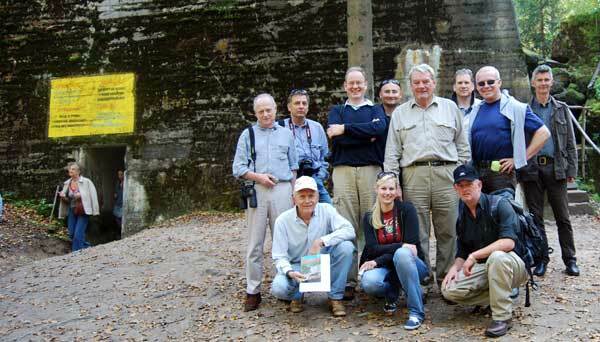 David Irving, "J.," and some of the 2010 tour group he led to the Führer's Headaquarters in front of Hitler's Bunker at The Wolf's Lair in East Prussia, September 2010. Others inside bunker, missed photo call. Motto of 2011 tour, starting September 1: "Let's invade Poland again." HOW does Mr. Irving do it? Within the space of two weeks, he comes from a tour of Auschwitz, a tour of the Wolf's Lair, an English sojourn, and then to the American cousins, to wit, driving from Nashville, to Atlanta, and on to Clearwater. Thence to his lair in Key West. For a gentleman of his age he reminds one of Dr. Samuel Johnson touring the Hebrides in his sixties. As diarist James Boswell wrote, "A greater journey has never been attempted by one of such years" (or something like that). Mr. Irving, having survived the American diet, was predictably slumped in his chair. He rose briefly, but gave most of his topic "Hitler's People" from a chair. To his right the delightful and gorgeous "J" teased him on his many idiosyncrasies, half-stealing the show. But it was a right good talk, in fact, an intimate evening in which Mr. Irving, in his Saville Row best, offered a deeply personal discourse on his life, his old Rolls Royce, and his prodigious potpourri of interviews with various officials, soldiers and secretaries of the Third Reich -- most significantly, intimates of Adolf, his secretaries, bodyguards, and "loyal" minions. There is no one who has spoken to more (once) living Nazi bigshots than Mr. Irving, and no one but him (it seems) has garnered their utter trust. The followers of David Irving were doubtless familiar with his gambit, his track on Middle-Atlantic English and his to-do's with book editors. He gave an amusing tale of a compliment: "Your wife is very homely." In England, a compliment, one's wife being lovely, honest, and a veritable hearth-fire. Not so in America. Or, "I'll visit your wife and knock her up," which in Merrie Olde means "knock on the door;" hereabouts, something else. Irving adherents who watch the YouTube lectures will recognize Mr. Irving has several verbal mainstays, which serve mainly as ice-breakers. Similarly, he related the story of Adolf Hitler's fountain pen, snitched by Otto Günsche, and preserved anonymously among the latter's effects during his ten year stay in the Gulags. Only about ten percent of German POWs survived their Russian hospitality. 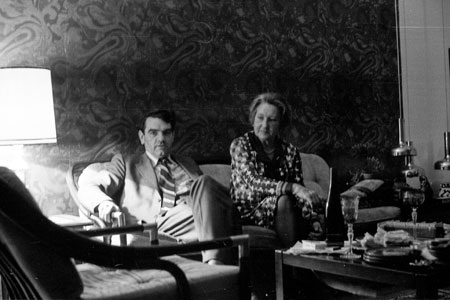 He went on to detail his visits with Hitler's secretaries (he had four) and that Hitler needed to chat with the ladies at day's end, generals and politicos having eaten his fire. "He wanted a bit of apple cake and a chat." One secretary [Johanna Wolf] had spoken to no one, and Irving respected her privacy. Which engendered respect from the others. He would have the interview, and quickly learned exactly when "it was time to listen." David Irving would then go home and write down everything he had heard, as no one in the Hitler circle would record or give evidence (that could be used against them) knowing that it was being transcribed. It is impossible to doubt Mr. Irving's honesty about these encounters, and all Irving followers should remind themselves that the press continually twists his remarks. As in the famous remark about the Auschwitz "gas chambers" : "More people died in the back seat of Ted Kennedy's..." etc. 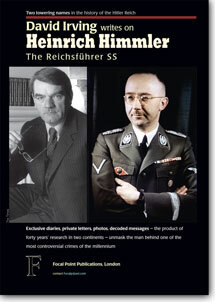 Mr. Irving was referring to the reconstruction of the gas chamber by the Polish/Russian regime. Hence his view of Auschwitz as a "Disney world" presentation. Indeed, "What you see is the work of Hollywood [type] carpenters." That it was a reconstruction was not admitted for many years. No one can argue that it is a huge tourist attraction. 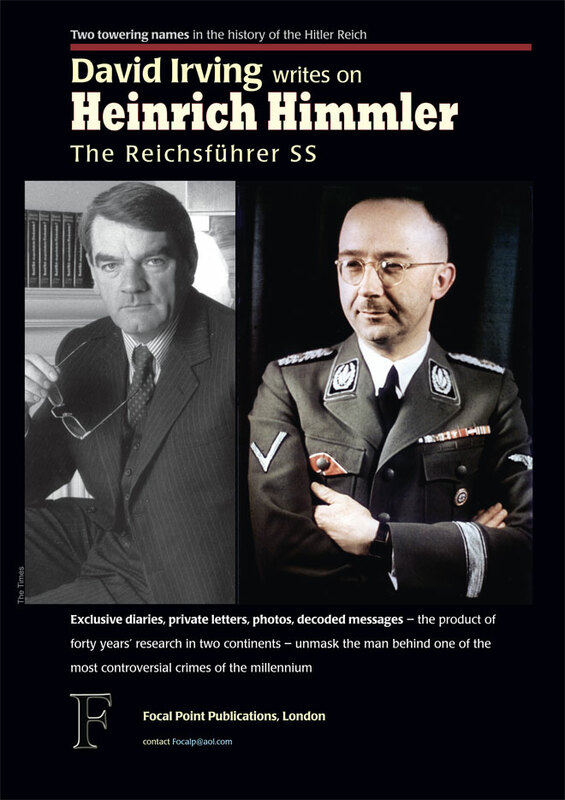 Mr. Irving also referred to his upcoming Heinrich Himmler biography, and brought up his interview with Himmler's brother Gebhard, who told him "Heini was a coward" -- scared of Hitler's disapproval. This Mr. Irving linked to the Holocaust question and showed that Himmler had every reason to keep the Führer out of the loop. He emphasized that the British had been reading the SS and Police encoded transmissions which often refer to direct exterminations, but leave many questions open. In America the literal German mind is greatly misunderstood. Their bureaucracy functioned on written orders, not hints, or hems or haws. Mr. Irving also made a significant point: "Back then, the written word prevailed. Now it's all email and phone calls." How true! 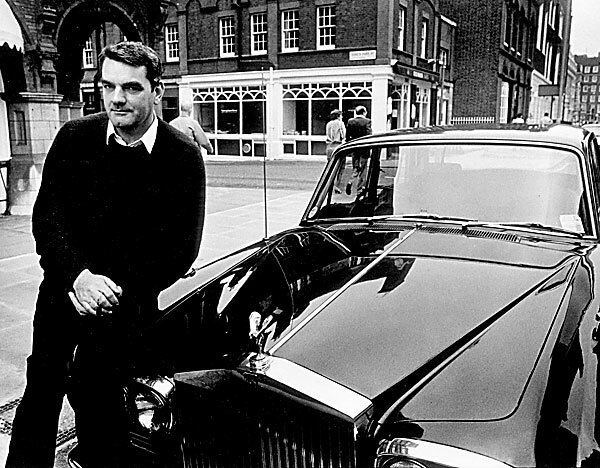 Historian with n*gger-brown Rolls Royce, in the good old days (Photo: THE TATLER). With the success of his Rommel book, Mr. Irving was able to fill a bag with pounds sterling and tramp to the Rolls Royce dealer in Berkeley Square, Mayfair. At first rebuffed, he showed the contents of his sac. "Ah. Which one would you like?" asked salesman, as Irving pointed at the Silver Shadows. "The n*gger brown one, Sir," was his reply; at the time a perfectly normal color description. "Ah. We call that chocolate-bean brown, Sir." THE question periods brought forth a number of "what if" questions, usually an historian's biggest waste of time. But Mr. Irving turned these "what if Hitler had died in the bomb blast?" enquiries into the obvious assertion that the Russians would have preyed on the civil confusion, and would have raped and killed even more Teutons, that the Allies had "unconditional surrender" tattooed on their souls, and that even Dunkirk was explainable: No one, least of all Hitler, having fought them in WWI, thought the British would ever abandon their posts and betray their Belgian and French allies. The British genius for defense is its sharpest spike. Irving related an incident when the German chief of naval operations staff asked, "When can we have the 'invasion barges' back?" to which Hitler replied, "they are my ruse" -- explaining that he never had a a real intention or plan to invade Britain. Mr. Irving also mentioned Churchill's alcoholic rant and order to launch poison gas attacks on six German cities (at a Cabinet meeting on July 6, 1944, confirmed by the diaries of four of his toadies). Hitler not only forbade the assassination of generals and politicians, he said, but ordered: "Germany will never be the first to use poison gas." If only Kaiser Wilhelm were of a similar drift! Indeed, in 1944 the Germans had a huge storehouse of nerve gases, thirty thousand tons, of which the Allies had no knowledge, let alone gas masks to protect them therefrom. Now, if Hitler had released it on D-Day? Mr. Irving demurred. Thus, most of the "what if" poseurs were deflated. So, everyone got their money's worth, and David Irving, adored and bedraggled, went to (hopefully) a few luxuriant days in Key West. Should he ever write an autobiography, it should be entitled "My Struggle". Wait a minute, I think that's been used before. Never mind, the public's memory is short.